I thought my brother was coming to town over the weekend so I offered to help mom out by fixing lasagna for a family dinner/football watch party on Saturday night. I offered because I had a package of ground beef and two packages of Italian sausage I needed to freeze or use. I’m still out of a job so my mom wouldn’t have let me cook if I was going to have to buy anything. I cooked up the meat the same day, bagged it up and put it in the fridge. Turns out my brother got sick and had to cancel, but fortunately I found out before I’d committed to using the entire three plus pounds of meat. I split the meat into three freezer bags and put it in the freezer. Game night rolls around so I pulled one bag out of the freezer and made a quick batch of spaghetti for Dillon and I to eat during the game. It was really good! The dinner, and the game! We won! I have a tendency to make too much pasta for the sauce I’ve prepared so this time I went on the conservative side and ended up with just the right amount for dinner, but then had leftover meat sauce when we finished. I was still in the mood for lasagna so on Sunday I whipped this up with the leftovers… thus the title. Following my plan to use only what I had on hand I pulled out an opened tub of cottage cheese for the cheese layer. I added an egg, a scoop of sour cream (just because I like it) and mixed it up. I also had some slices of provolone and Farmers cheese handy. Instead of boiling the lasagna noodles, I tried a tip I saw on TV recently. I soaked the noodles in a casserole dish filled with hot water. I used hot water from the tap and let the noodles soak while I mixed the cheese and got everything ready to layer. It worked like a charm. Since I wasn’t making a full size lasagna, I put this together in a loaf pan. I was able to use scissors to cut the noodles to the right length and size. The noodles were a tiny bit crispy, but if I’d let them soak 5–10 minutes longer, or poured boiling water over them they would have been perfect. At any rate it removed one gigantic step from the process. 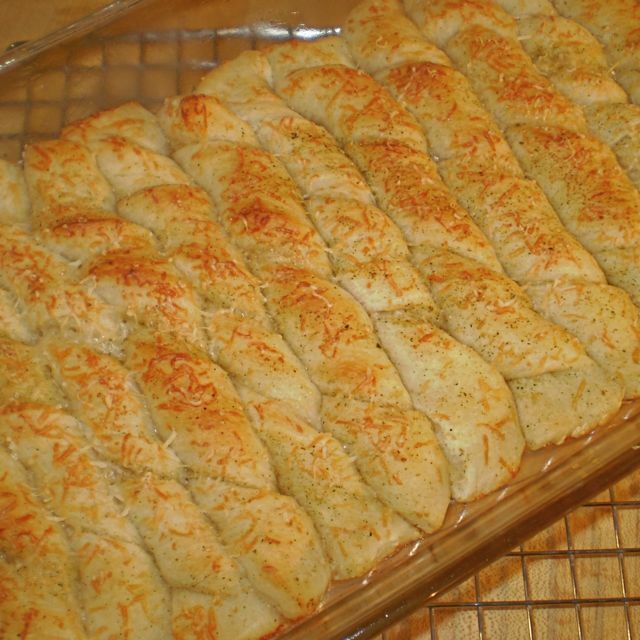 So I layered it and put it in the oven and went to work on my cheesy Parmesan breadsticks. 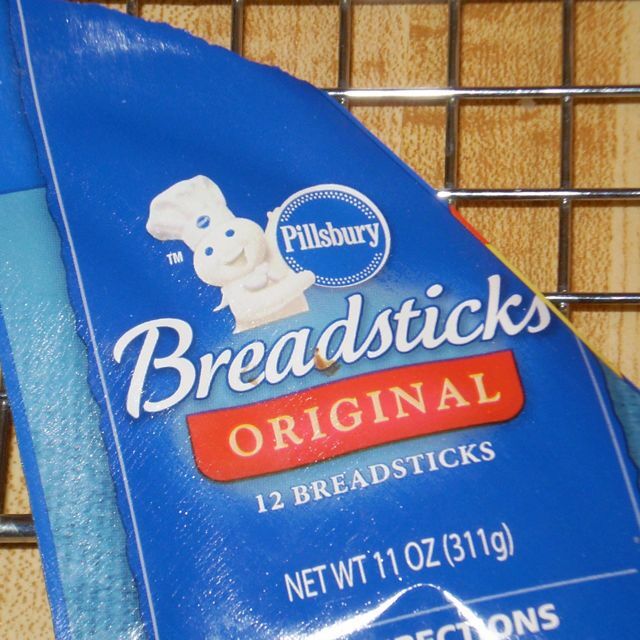 I popped open a can of Pillsbury Breadsticks and dried the casserole I used to soak the lasagna. I swirled a splatter of olive oil in the bottom of the dish. I wanted to use melted butter, but opted for a healthier fat. I separated the breadsticks and coated them with oil. I left them flat and sprinkled my own blend of seasoning over the top and then turned the breadsticks and seasoned the other side. Next I grated Parmesan and Romano cheeses over that. 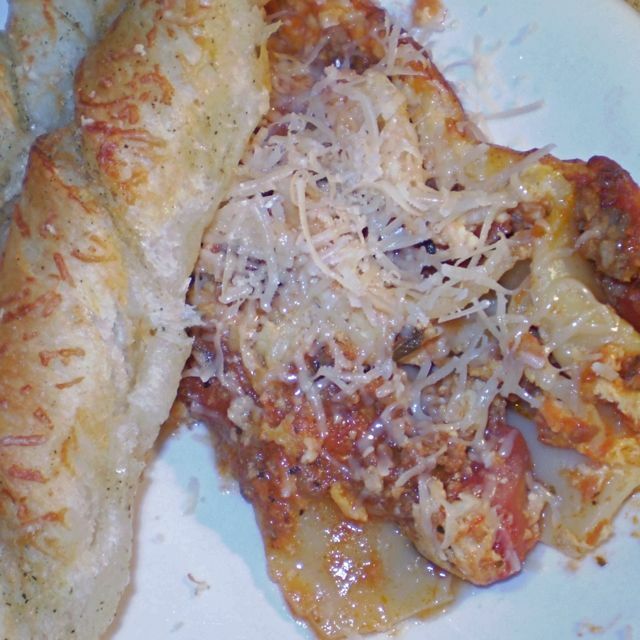 I twisted the sticks as directed added more cheese and then put the dish in the oven next to the lasagna. About 12 minutes later the breadsticks were golden brown. Very impatiently, I tried to wait the suggested 5-10 minutes to let the juices set a bit before cutting it, but I still dipped it out pretty juicy. No matter. It tasted great! Now I have leftover Leftovers Lasagna to warm up for lunch or dinner the few days. I am hooked on Mad Men. This Emmy Award winning AMC original series seems to capture the feel of the early 60s. Before Viet Nam, before the hippies, it was known as the Days of Camelot. I love the styling of the sets, the fashions, the two-martini lunches, not to mention the characters and the stories. The dialog is filled with anecdotal comments that evoke the attitudes of the early 60s. I was just a kid, but it reminds me of Doris Day movies and the fashions of my original Barbie doll. Much has been made of the cocktails of the 60s, a Manhattan, Gimlet, Old-Fashioned… but not much has been said about the food. A few weeks ago Don Draper came home from work and his wife Betty offered him a late supper. “Hot or cold?” she asked. The options were chicken salad or tuna casserole. I looked up tuna casseroles in The Joy of Cooking, and The Modern Family Cookbook, as well as a Good Housekeeping cookbook, all with late 50s copyrights. These are cookbooks Betty might have in her kitchen. It was interesting that all the recipes called for 7 ounce cans of tuna while the cans in my cabinet are only 5 ounces. One simple recipe with only 3 ingredients called for tuna, noodles and white sauce. Simple except the white sauce was homemade, which requires standing over the stove and stirring until the butter, flour and milk are combined to the right consistency. Toppings included corn flakes, potato chips and buttered breadcrumbs. One called for buttered cornflakes. How do you butter a cornflake? Seasonings included Worcestershire, sherry, or curry powder to name a few. Some recipes layered the ingredients into the casserole dish, others mixed them first. I used a combination of methods, layering and combining, when I came made my casserole this morning. Boil water for noodles and preheat oven to 375°. Dice equal amounts onion, red pepper and celery—about 1/2 C each—and sauté in a splash of olive oil, preferably in an iron skillet. Drain noodles/pasta and rinse in cool water. Drain again. Pour a splash of olive oil into the casserole and brush to cover bottom and sides. Put the noodles/pasta in a layer on the bottom of the dish. Spoon the sautéed veggies on top of the noodles. Sprinkle a layer of frozen peas over the top of the veggies. Open the soup and tuna and dump them into pasta pan to combine. Don’t drain the tuna and add a splash of milk if the mixture is too thick. Pour the combined soup/tuna mixture on top of everything in the casserole. Spread to cover all the edges. 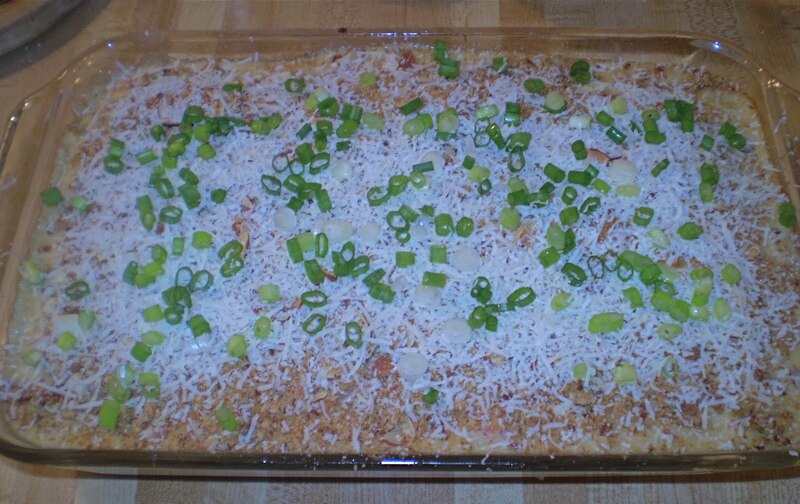 Sprinkle a topping of almond slivers/crumbs over the top of the casserole. Top it all with a layer of dried seasoned breadcrumbs. Bake about 30 minutes until heated through. 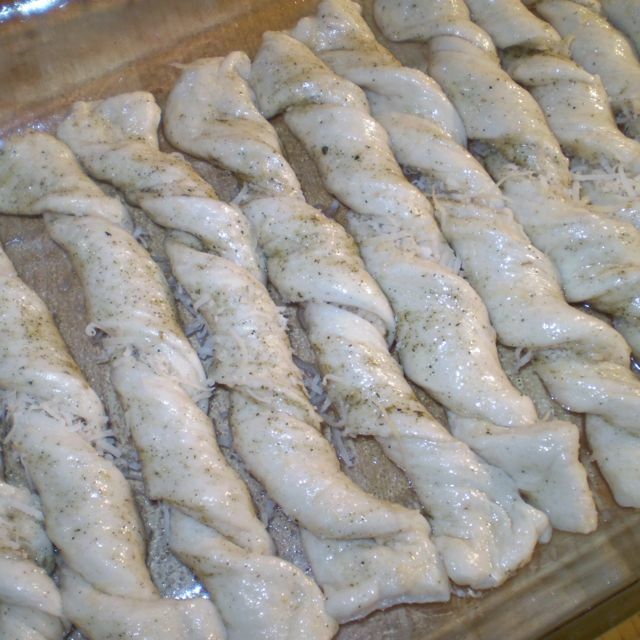 Remove from oven and garnish with grated Asiago Romano cheese, diced green onion, and sliced green olives. Top each serving with more cheese, a sprinkle of almonds and fresh grated black pepper. 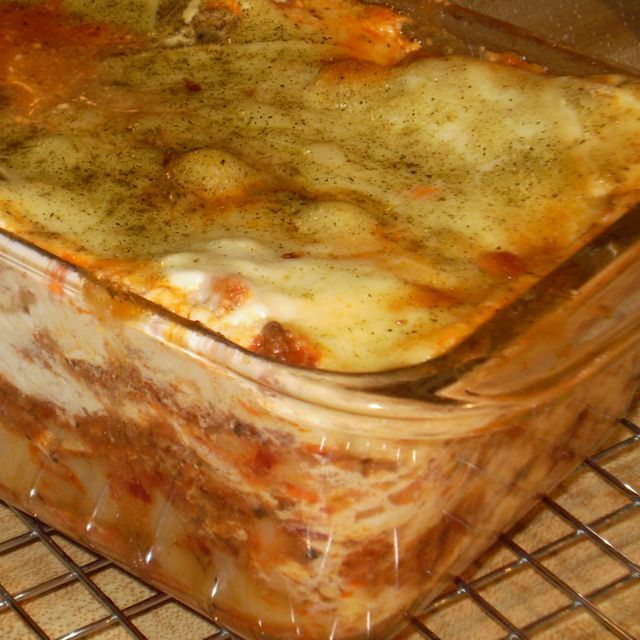 This casserole can be made a day ahead and refrigerated. Warm to room temperature and add the almonds and breadcrumbs before placing in the preheated oven. Make individual portions by assembling in mini loaf pans. 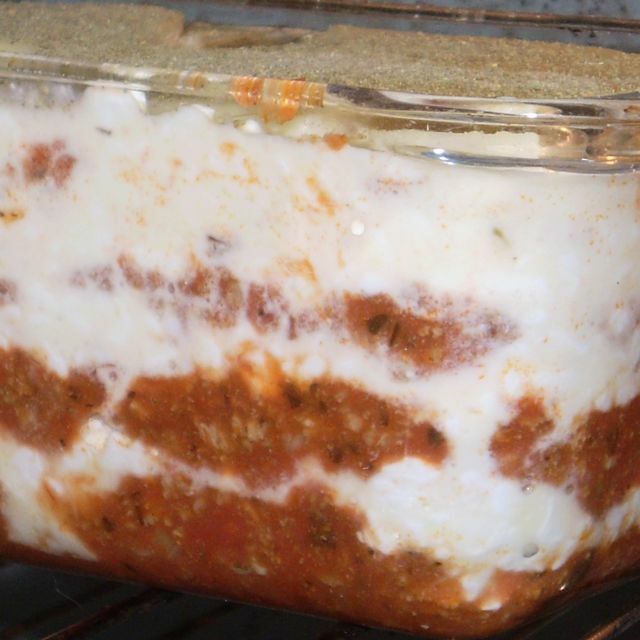 To freeze, press plastic wrap to the surface of each casserole and seal each tightly with aluminum foil. If desired, splash each portion with Tabasco Sauce before serving. Divide leftovers into serving size containers for brown bagging. Heat in the microwave, but don’t over cook or the noodles may end up tough and dry. Top with fresh garnishes and it will look and taste fresh from the oven.